NSW Tourism Minister Adam Marshall cuts the ribbon to open Crown Group’s Skye Suites. 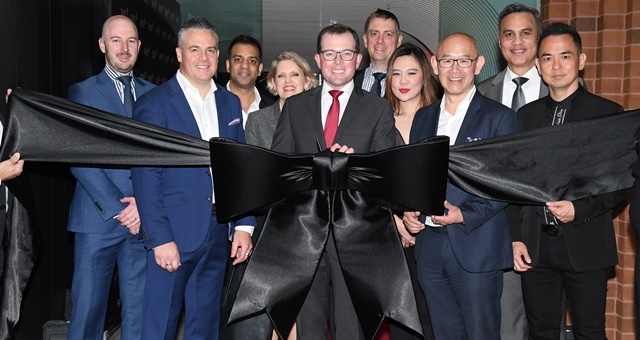 A sparkling ribbon-cutting ceremony has marked the official opening of SKYE Suites – the newest hotel to open in the Sydney CBD – with a glittering party attended by dignitaries from state government, the hotel industry as well as corporate and elite social circles. The new tower houses 73 boutique serviced apartments catering to both short and long-term accommodation seekers, offering a mix of studio, one and two-bedroom apartments. It sits within Arc by Crown Group, the hotel and real estate developer’s new mixed-use tower, located at 300 Kent Street. The new hotel comes amid the newly revitalised Skittle Lane located nearby, now home to swathe of new restaurants, hole-in-the-wall bars and ‘Reflect’ – a public art installation featuring hundreds of LED lights set within a steel frame and stainless wires. Designed by Japanese architect Koichi Takada, the narrow twin 25-storey towers feature signature brickwork and a series of arches creating a curved roof structure. These arches filted down and feature throughout the building through arched balconies and a curved ice cavern-style lobby. 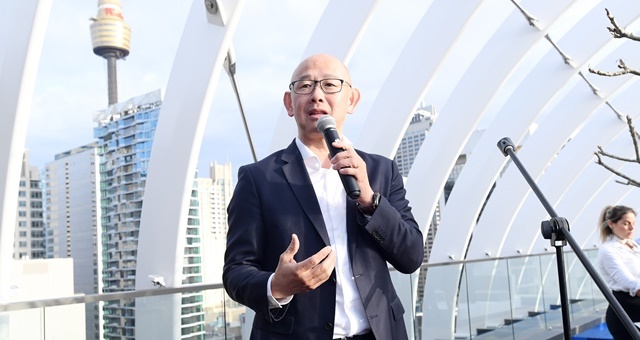 Crown Group Chairman and Group CEO Iwan Sunito addressed attendees at the elegant party. Hotel suites are elegantly furnished, each fitted with appliances from DeLonghi and Vittoria coffee machines. Kevin Murphy toiletries, hair products and amenties are available in each bathroom. Guests will also enjoy free wi-fi, laundry facilities, stocked minibars and a bedding firmness menu which can be adjusted to suit personal preferences. A fitness centre and indoor swimming pool is open for all guests to utilise, along with a rooftop Horizon Lounge. “SKYE Hotel Suites is redefining the boundaries of the 5-star luxury hotel experience for domestic and international visitors and business travellers,” Crown Group Director of Hotels, Wayne Taranto said.